It’s all about numbers. St Johnstone went into this game having lost on their last four visits to Dens Park and in pretty wretched form. 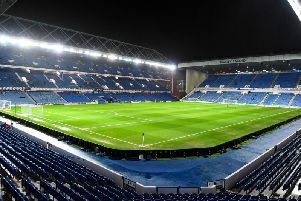 After an extraordinarily one-sided Tayside derby they banished their woes at this venue, scored four goals, and suddenly are looking up the table rather than glancing anxiously over their shoulders. If anyone is on all fours now it’s Dundee who really have a serious fight on their hands to steer clear of the relegation play-off spot on the basis of this abject display. Some of the battling spirit they will need was shown in the wrong place at the wrong time as manager Neil McCann got involved in a heated altercation with the St Johnstone dugout after the game. His counterpart Tommy Wright was less than impressed by what he witnessed but channelled his emotion into a raucous celebration with his own fans afterwards. Dundee’s home form in 2018 has gone through the floor with - that number again - four consecutive defeats at Dens Park. It quickly became apparent that this was not going to be the day they arrested the slide as they endured nightmare opening 45 minutes. It was always going to be a severe test of their mettle to be missing the guile and savvy of the injured Glen Kamara and Paul McGowan in their midfield engine room – but truth be told Dundee were misfiring and crunching gears all over the pitch. Hesitancy and misunderstandings stalked the hosts and Wright’s gang of streetwise old troopers from along the Tay took the scruff of the neck. The Perth side pressed high up the park and home rearguard simply buckled. Both St Johnstone goals before the break were perfect cameos of what had been going on. The opener saw the Dundee defence unable to clear a corner and as the ball was played across their box Steven Anderson fed Murray Davidson whose skidding shot was diverted into his own net by young Jordan Piggott, introduced only minutes earlier to replace the injured Lewis Spence. If that was unfortunate Saints’ second was just plain carelessness by the hosts with Josh Meekings trying to usher a ball over the line for a goal kick only to be robbed by Steven MacLean. The wily striker picked out Blair Alston whose square pass was slammed in the net by Chris Kane. It was an awful goal to lose and didn’t the querulous home support let McCann and the players know it. A couple of decent runs by the mercurial Roarie Deacon apart, Dundee offered little going forward, but a misjudgement by Anderson so nearly allowed Simon Murray to grasp a lifeline. A high risk, but it turned out perfectly executed, intervention by Scott Tanser took the ball off the striker’s toes and the chance was gone. There was a brief rally from the hosts just after the interval but in truth it didn’t amount to much. As a side who enjoys soaking up pressure and hitting on the break the game was now perfectly set up for St Johnstone. A devastating two goal burst just as the second half reached its midway point finished off the sorry hosts and sent many of their fans heading for the exits. The end was nigh when Kane burst through the bedraggled home rearguard once more and although his shot was blocked it rolled into the path of Alston who buried it mercilessly. Two minutes later the effervescent Kane slalomed over the treacherous surface and despairing tackles to slot in Saints fourth of the afternoon and notch up an empathic victory that few would have seen coming.